5G is set to enhance connectivity across networks. This is especially important as the number of Internet of Things (IoT) devices rises, along with the amount of data they generate. The technology will enable faster data transfer speeds (from 4G’s 1Gbps to 10Gbps). As a result, 5G creates a tremendous opportunity for numerous industries but also sets the stage for large-scale disruption. Major 5G network deployments are expected by 2020, and a projected 4.1B IoT cellular connections will use 5G worldwide by 2024, according to Ericsson. From supply chain management, transportation and logistics, manufacturing, to retail, to name just a few, 5G is poised to disrupt a plethora of the world’s biggest industries and global marketplaces. Installing 5G-enabled IoT sensors on products could easily make a large amount of data could available to stakeholders in the supply chain in real time. The data may include location, temperature, moisture, pressure, and other information that can be crucial to properly managing products in a supply chain. Introducing 5G IoT sensors into supply chains could mean fewer losses due to manual inefficiency or misplaced containers. As 5G technologies introduce more intelligent supply chain management, there could be potential for increases in production, streamlined logistical processes, and reduced costs. Connecting public and private vehicles with 5G could change the way people and goods travel around the world. 5G technology could provide increased visibility and control over transportation systems, from public buses to private logistic fleets. As 5G networks become more prevalent, cities will gain invaluable access to real-time, end-to-end visibility into their transportation systems. 5G could allow enhanced vehicle-to-vehicle communications (V2V), a key component to improving road safety in the emerging world of driverless vehicles. It is essential that V2V communications take place in real time, as a matter of milliseconds could be the difference between a close call and a fatal collision. Achieving this high speed of interconnectivity requires vehicles to transmit large amounts of data between each other without any lags. 5G networks could make this possible with their low latency. 5G could also play a crucial role in vehicle-to-infrastructure (V2I) communications. V2I communications connect vehicles with infrastructures such as traffic lights, bus stops, and even the road itself. This could improve traffic flow, reduce external danger factors, increase vehicle reaction time, and make public transportation more efficient. 5G technology could help production operations in the manufacturing industry to become more flexible and efficient while enhancing safety. This would enable manufacturers to enhance “smart factories,” which leverage automation, artificial intelligence, augmented reality, and IoT. Tethered and untethered robots could be controlled, monitored, and reconfigured remotely over the 5G mobile network. 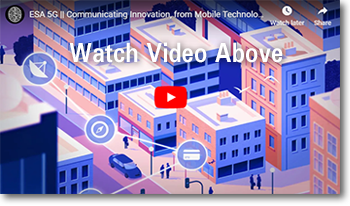 This next-gen wireless technology might also result in increased adoption of augmented reality (AR), as 5G networks offer the high bandwidth and low latency required for sustained augmented image quality. In a factory setting, this means AR could support training, maintenance, construction, and repair. For example, an Ericsson factory in Tallinn, Estonia has adopted AR for troubleshooting to help mitigate the costs of breakdowns and reduce production downtime. It has reported that adopting AR has boosted productivity by 50%. As networks continue to adopt 5G, more manufacturing use cases will come to light. Samsung and AT&T have partnered to create the United States’ first manufacturing-focused 5G “Innovation Zone” in Austin, Texas. This testing ground aims to demonstrate how 5G can impact manufacturing. AT&T is working diligently to make 5G a reality in the US. In 2018, AT&T introduced standards-based mobile 5G to parts of 12 cities around the country and is planning to expand into parts of another seven cities early next year. “We’re at the dawn of something that will define the next decade and generation of connectivity,” said Andre Fuetsch, Chief Technology Officer of AT&T Communications, in a recent press release. Meet 5G: the next generation of communication services. It will affect everybody, changing the way we work, communicate and interact with technology. It will rely on a harmonious integration of networks, driving a convergence of fixed, mobile and SatCom services (watch the video above). The ESA’s Satellite for 5G (S45G) programme aims to promote the value-added benefits that outer space will have on 5G by developing and demonstrating integrated terrestrial and satellite-based 5G services across multiple markets. The agency supports the technological and supply chain evolutions required to weave together terrestrial and space services, focusing on the transport sector (maritime, aviation and land), public safety, media and broadcasting, and other areas of interest. Mobile shopping has become incredibly popular among consumers worldwide. Over 100M Americans made a purchase on their smartphones in 2018. This migration to mobile shopping largely occurred thanks to 4G/LTE. Imagine how mobile shopping experience could be affected if mobile connections were 10 times faster. 5G could open the door to VR dressing rooms as well as mobile AR experiences in stores and at home. 5G’s low latency enables mobile AR/VR applications without the motion sickness some experience when using the technology today. With 5G, it will be possible to try on an array of outfits virtually from the comfort of your home. Worldwide spending on AR and VR applications is expected to surpass $20 Billion in 2019, according to IDC. Due to mobile devices’ low throughput, high latency, and inconsistent connectivity, cloud applications are often watered down in terms of features and functionality. With 5G, mobile apps could become more sophisticated than ever before – the technology could make it easier for mobile devices to communicate in real-time with a central server. The technology’s ultra-low latency and high throughput would also allow the cloud computing experience to rival corporate LAN connectivity to desktops. Communication is key when it comes to military strategies. Real-time data collection and transmission to devices within communication networks are crucial, and 5G technology could minimize the speed of data transmission. Enhanced connectivity could minimize confusion and delay while relaying information in a life-threatening situation in the field. This could help prevent injuries and deaths in war zones. 5G technology will be important in military supply chain upkeep, as well. Better data collection on material usage can help with future military budgeting by providing a clearer understanding of spending and resources. 5G has the potential to transform how children and adults are educated, including executive education programs. AR/VR educational platforms provide a number of benefits over traditional educational methods, including cost-effectiveness, lower risks, and increased retention. A study conducted by Next Galaxy Corp and Nicklaus Children’s Hospital found that medical personnel retained as much as 80% of the course material after being trained with VR, compared to retaining only 20% of information from a traditional training session. For students in high-risk fields such as medicine and aviation, these VR learning experiences could prove to be especially useful. As reported by Quartz, there’s been a great deal of speculation about the global race to achieve mainstream 5G. Today, AT&T is on pace to turn that buzz into reality in the US. In fact, 5G is already being deployed with encouraging preliminary results in parts of some major US cities. AT&T is committed to helping establish the framework for the connected American cities of the future. With the gears of connectivity already in motion, 2019 promises to be a year of continued growth and forward momentum for 5G. Stability, Flexibility, Ease of Use, In-Vehicle Management & Logistics SystemNew! This case study paper details how Advantech-DLoG helped build the required high-quality in-vehicle management systems for SPAR, one of the leading manufacturers in the European logistics industry.Download Now! The Unbreakable Chain: A Look at Uninterrupted Cold Chain Management at Hypermarket Scale New! This tech brief details how an international hypermarket chain introduced Advantech’s Cold Chain Management Solution practices for monitoring frozen/refrigerated food product safety.Download Now! This white paper describes how to profit from cold storage ‘last mile’ logistics business benefits including lowers operating costs, reducing system downtime and interruptions, increasing productivity, greater product longevity, improved data integrity and inventory management. Download Now! This whitepaper shows industry survey results from adopters in supply chain management and offers insights on ROI for supply chain investment, the data offers a comparison to your own status and stacks it against transformation trends. Download Now! Latest Technology NewsBureau of Labor Statistics Report Downplays Impact and Severity of Truck Driver ShortageMarch 22, 2019 · A recent report issued by the Department of Labor’s Bureau of Labor Statistics questions if the driver shortage is as bad as it purported to be within industry circles. 2019 Outlook for Parcel ShippingMarch 19, 2019 · Consumers will Continue to expect fast, reliable delivery.